The Art Exhibition, now in its 31st year, offers a unique selection of contemporary painting, sculpture, prints and jewellery from over 100 of Scotland’s most established artists. 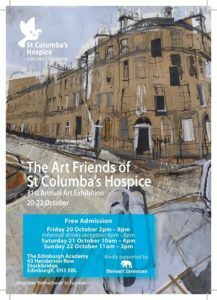 The Edinburgh Academy, in the heart of Stockbridge, provides the perfect setting to browse our exhibition and buy original artworks while helping to support the work of the Hospice. Come along on Friday 20th October, from 6-8pm, and join us for an informal drinks reception as you peruse our collection. Our mission is to improve the quality of life for people with terminal illnesses while providing support for their families and loved ones. We are currently expanding our pre- and post-bereavement support, developing an art room where patients and their loved ones can take part in creative workshops, and taking more of our services out to our patients who wish to be supported at home. All funds raised through our Art Exhibition will go towards providing our specialist care. To find out more about St Columba’s Hospice please visit our websitewww.stcolumbashospice.org.uk or telephone us on 0131 551 1381.